It's a dangerous mission, riddled with uncertainty, split-second decisions, and balancing atop a large blue ball. No, it's not the circus, it's Finn's nap time. Finn Johnson is a 9 month old baby who refuses to nap. He would prefer a 5 hour stretch of wriggling, eye-rubbing, whining, fussing and flopping all over the living room, rather than take the dreaded nap. Finn's mom, Lyndsay, says this is her biggest challenge to date. "You worry that your newborn will keep you awake crying. But you don't expect to have a child that refuses to sleep, period!" says Lyndsay. He even fights going to sleep at night ("sleepy sleep time," as it's called at the Johnson's), and will wake up a few times a night just because he might want to play or see what's going on with Mom. "I've never encountered a baby with so much energy," says Lyndsay. "I read somewhere that 9 month olds need 14 hours of total sleep in a 24 hour period. I laughed out loud." "I start by making sure he's very full. I know it's not recommended that you nurse your baby to sleep, but if nothing else works, I'm a-nursin'! Then I cradle him in my arms, sit on the exercise ball and bounce, bounce, bounce. On a good day, he's eyes will get heavy, and I can get him to sleep. But as soon as I put him in the crib, it's all up in the air!" But on a bad day? "Well, I get a wriggling, screeching baby trying to get out of my hold and slink down onto the ground and go play." 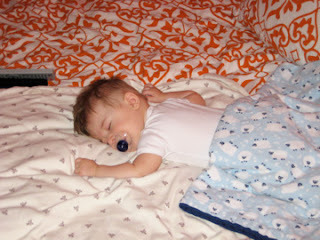 Once Finn has drifted off from bouncing, it's hard to say if he will stay asleep once he's in the crib. often Lyndsay will bounce or 5, 10, even 15 minutes after his eyes have closed just to ensure his slumber. But nothing's certain. He could roll over onto his stomach and keep snoring away (yes, he snores). 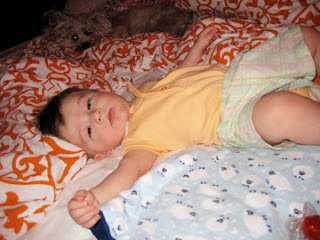 Or he could roll over and come right up into the crawling position, pull up in his crib and scream until someone comes. Sometimes this routine will go on for an hour (bounce, sleep, crib, cry) until he either passes out for a short-lived nap, or Lyndsay gives up and takes him out to play again. The only saving grace is that Finn loves his pacifier. Lyndsay keeps 4 of them in Finn's crib at all times. That way if he wakes up, he can hopefully find on on his own and go back to sleep. So how long does an average nap last? "Anywhere from 15-40 minutes. But there is only one of these a day, making it hard to accomplish much around the house." 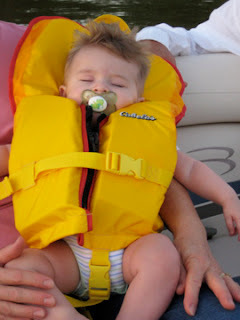 Ironically, Finn will take 3 or 4 long naps a day if he's in his car seat on a road trip (or on a boat in Texas). And better rest during the day, makes for a more restful baby at night. "Studies have shown that babies who nap tend to sleep longer–and better–at night, and are less fussy during the day than those who don't nap" (Parentpedia website). But who has time to drive baby around all day? "Maybe I should get a paper route," jokes Lyndsay. When asked how he feels about Finn's sleeping habits, or lack thereof, Wes jokingly responded with "What can I say...he's not a human baby." But of course, he means that in the most loving way. This is Lotta Scoop, signing off. Michael would gladly take Finn's naps for him! Bless Finn's mother, I say. I have a hard time remembering the days before Cohen slept through the night and took a daily 2.5 - 3 hour nap. I think it's a mental block I created so that I'd want more kids! By the way- Congrats to Wes for breaking away from the Man. I bet he is so excited!